Liz Foley and Beth Coates of Penguin Random House talk to BookBrunch about their latest work as authors, What Would Boudicca Do? 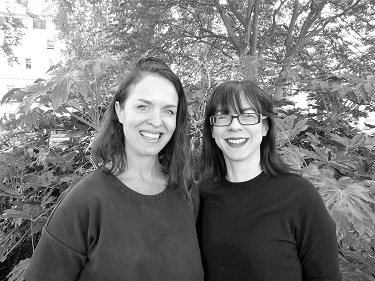 Liz Foley is publishing director at Harvill Secker, and Beth Coates is editorial director at Vintage. The colleagues are also writing partners, on books including Homework for Grown-ups and Shakespeare for Grown-ups. What Would Boudicca Do? : Everyday Problems Solved by History's Most Remarkable Women offers life-lessons from the biographies of more than 50 women, among them - as well as Boudicca - Mary Wollstonecraft, Mae West, Sappho, Dorothy Parker, George Eliot, Catherine the Great, Hedy Lamarr, Nell Gwyn, and Queen Victoria. BB: A number of recent books have celebrated inspiring women. How have you approached the subject? F and C: The idea for Boudicca came to us after the women's marches around the US inauguration in January 2017. We loved the sassy signs people carried, and one that we saw over and over again referred to Nasty Women. (Hilary had been called a "nasty woman" by that nasty man). This gave us the idea for a book celebrating the best NWs of the past. The concept changed as we talked it through with our brilliant editor Laura Hassan, and we fixed on something more playful than straight mini biographies. That's why we link our heroines from the past to the problems facing us in the present. Our book is definitely not for kids - there is much enthusiastic swearing in it, and it covers issues like work-life balance, imposter syndrome, failure, cheating and assertiveness. We also didn't want to sugar-coat the fact that some of these impressive women have dark sides. We hope readers will find it entertaining and inspiring, and see how the lives of outstanding and imperfect women from history cast new light on some of our own everyday problems. We're delighted to be part of the necessarily noisy recognition of women's contributions going on at the moment. BB: Describe the process of coming up with the entries. Were there omissions you regret? F and C: This was one of the most enjoyable parts of writing the book: delving into all these amazing stories and looking for points where certain troubles and triumphs intersected with situations we still face today. Some required a bit of creative thinking: Sappho was an interesting one. So much of her work has been lost, and biographical facts about her remain sketchy at best - though that hasn't stopped historians endlessly debating her straightness or lack thereof. But the poetry that has survived meant she struck us as perfect for teaching us a bit about self-acceptance, so her chapter is "Sappho and Backing Yourself". In terms of omissions, we have a list of 223 women, filed under "Spare Ladies", whom we discovered or admired who could easily have made the cut. But we knew we wanted just 50, and we were keen that they were from all over the world, from different periods in history, and that they covered a broad spectrum of expertise: sports, politics, music, science, religion, philosophy, fashion, literature, piracy etc. We definitely feel guilty about Marie Curie and Maya Angelou not being in there, but we also wanted to make sure we unearthed some less well-known heroines. BB: 'George Eliot was not a looker. So what?' Isn't this what John Inverdale said about Marion Bartoli? Anyway, give us a flavour of some of the messages you'd like your book to impart. F and C: Our George Eliot entry starts with Henry James' famous criticism of her physical appearance and we go on to talk about how irrelevant women's looks should be in discussion of their contribution to the world. George Eliot had an incredible life and has left an indelible legacy, whatever Henry thought of her nose. The book is supposed to have a thread of humour, and we wanted to be a bit provocative and irreverent in our presentation of some of these icons - so alongside entries on standing up to bullying and body image we have more playful chapters such as "Emily Dickinson and Defying FoMO" and "Catherine the Great and Dealing with Gossip". F and C: Back in our youthful days we used to sit side-by-side at the computer collaborating on every line, which was a truly wonderful way to work, but nowadays we tend to split up chapters to work on separately and then we spend a lot of time editing each other. We're both editors in our day jobs of course, and this is the bit we love most - being edited by each other. BB: You have written books including Homework for Grown-Ups and Shakespeare for Grown-Ups. How did your collaboration come about? F and C: We started our jobs at Vintage as fresh-faced editorial assistants within a week of each other, and so we bonded on IT training courses and induction sessions involving slightly humiliating trust exercises. (Being an editorial assistant in those days was a lot of hard work, but also a lot of fun with all those launch parties, so we naturally socialised together a lot too.) We became great friends and also worked together closely on publishing projects. We enjoyed that so much and found ourselves inspired by each other, which meant we got it into our heads that we could do lots of great things together, even write books! The original idea for Homework came out of a lively dinner we had with Ros Porter from Granta and Lucy Luck from Conville & Walsh where we were all lamenting how much great knowledge we'd forgotten from our school days. BB: Your previous books have been with your own firm. This comes from Faber, albeit with your former colleague Laura Hassan as editor. How has your experience of working on the book differed? F and C: We were extremely lucky that we came up with the idea for Homework just as Square Peg was launching, and when we mentioned it to the brilliant Rosemary Davidson she asked us to put a proposal together for her. It was a bit of a fairytale as it became Square Peg's launch title and the team made it a number-one bestseller. This gave us the writing bug and we've loved working with Square Peg over the course of the last decade. Boudicca was something we wanted to do quickly. With Square Peg's blessing, we spoke to Laura as we thought she might like it, and we've been blown away by the enthusiastic welcome we've had from Faber and all the creativity that has gone into the book from the editorial, rights, publicity, marketing, production and sales teams there. We're well aware of how lucky we are to be in the right place at the right time and to have seen the work of two such amazing publishers from the other side. We hope it's made us better publishers ourselves to have had this experience. Photo (by Noor Sufi): Beth Coates (left) and Liz Foley. What Would Boudicca Do? : Everyday Problems Solved by History's Most Remarkable Women by E Foley and B Coates and illustrated by Bijou Karman is published by Faber on Thursday (6 September).